It’s a love story with difference – the friendship between a Costa Rican fisherman and a four-and-a-half metre (15 feet) long crocodile. Every Sunday, Gilberto Shedden dons a tattered pair of leopard-print shorts, dives into a lake and splashes about in the water with his crocodile Pocho, to gasps from a large crowd of locals and tourists. But for Shedden, his exploits with Pocho are more than just a show. 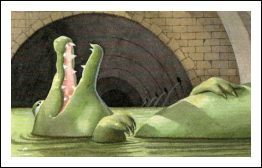 They demonstrate the friendship he has struck up with the crocodile, a reptile with a fierce reputation.